ESTA Ltd is a manufacturer of composite radomes for telecommunication and defense industries. Radomes protect a radar or other antenna from weather and other deleterious events. 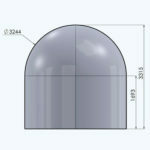 Radiotransparent antenna domes are optimized to allow minimal RF interference. Plastic Laminates are the most commonly used materials to produce radiotransparent structures – cowls, domes, covers and the like. Using various combinations of reinforcing materials, resins and fillers makes it possible to create materials and structures with a wide range of controlled properties. In process of preliminary research and development of structural and technological schemes while mastering the given class of wares interesting solutions have been found. Some findings in radomes' design are patented. These developments ts were put into a foundation of the structure and fabrication technique of radiotransparent dome on the order of “Delta-Pilot”. Operating Frequency - 1-18 GHz. 3,2 m in diameter - a spherocylindrical monolithic construction. 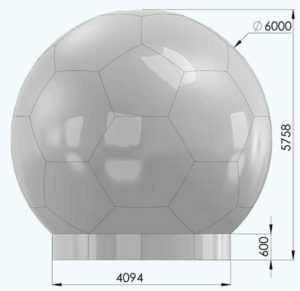 6 m in diameter - a spherocylindrical constraction with truncated icosahedron in spherical part, which is assembled from five- and hexagonal sections. There is 5- sections cylinder in the basis. 12 m in diameter - a spherocylindrical constraction with truncated icosahedron in spherical part, which is assembled from five- and hexagonal sections, which are made from standard triangular sections. There is 10-sections cylinder in the basis. 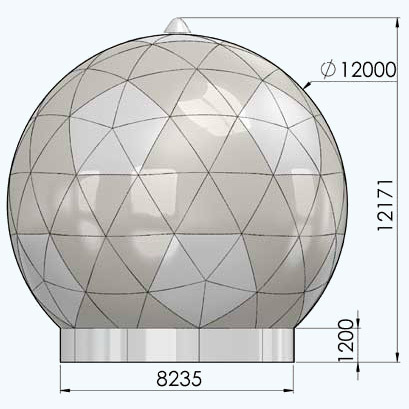 ESTA Ltd offers to develop and manufacture the radomes according customer specifications. 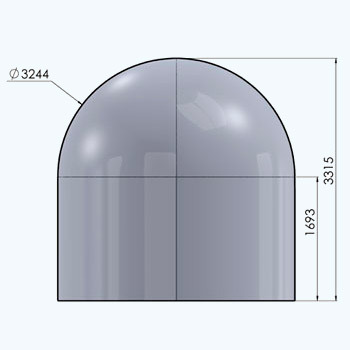 Spherical radome by request of the "Delta-lotsman" enterprise"
Plugs for radiotransparent antenna domes are made with the CNC milling machine for ensuring the accuracy of the geometry of 3-dimensional forms. Radomes are produced by vacuum infusion. That allows receiving durable qualitative plastic with stable thickness. A plug on CNC milling machine. The radome is made by vacuum infusion.